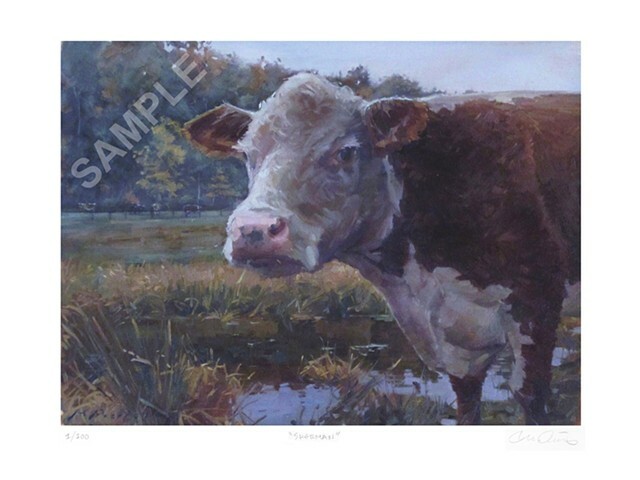 Limited Edition Print of "Sherman" from the Sanctuary Animals Series. Sherman is a cow who now resides at Catskill Animal Sanctuary. This painting is part of my ongoing Sanctuary Animals Series, a body of work that not only focuses on these individual survivors from often terrible, certain-death situations brought about by agribusiness and the meat industry, but also celebrates the fact that every animal has a unique personality and a name that should go along with it, not a number. A percentage of the sale of the original oil on canvas painting of Sherman was donated to Catskill Animal Sanctuary to help their much needed work.